Without any doubt whatsoever; Professor Ghiardi was the most memorable of the Law School Faculty when I attended (1975 – 78). I can still remember like it was yesterday when I was called upon in his Freshman Torts class. I can recall the case, I can recall what I said and what he said as he jumped out from behind the Lectern and said “Mr. Dineen don’t read your brief, tell me about the case”. I recall his words to me when I handed in my Torts blue book at the end to the first year exam. “Have a good summer Bill”. While it was a combination of fear and inspiration I truly studied harder for Torts than any other class in law school. Thanks for the Memories Professor Ghiardi. Information on Visitation and Memorials has been added to the main post. 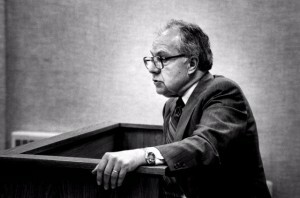 A tribute to Professor Ghiardi appears on the website of the State Bar of Wisconsin. I was fortunate to have studied torts under Professor Ghiardi in 1962 and to have been his research assistant the following year. He launched me on a career teaching torts . Professor Ghiardi was an inspiring teacher and mentor. I recently received the Prosser Award from the AALS and I attribute my love for torts to him. He was rigorous, humorous , dedicated and an intellectual giant. He will be missed . He was one of a kind.